Bill Collins manages Huron Ecologic, LLC, a small consulting firm specializing in wetlands, tree inventories, and other ecological services for private and public clients. Bill grew up in Fort Gratiot Township in Saint Clair County and was privileged to enjoy and study the forests, swamps, and lakeshore areas. Along with local naturalist friends, he taught nature at Silver Trails Scout Reservation in the 1970s through 1980s. He and his wife Cheryl, work together to protect the local environment. They have been fundraising on behalf of the Michigan Nature Association for the past year to purchase property in Kimball Township, the last of 6 documented sites in Michigan with Painted Trillium, a State Endangered woodland wildflower unique to the Blue Water Area. Those living near Lake Huron, especially in Saint Clair County, are probably familiar with the large ridges of sand that parallel the lakeshore, some over a mile inland. Unlike wind-formed sand dunes along Lake Michigan, these ridges are actually old beaches, deposited by ancient waves thousands of years ago. Known as glacial beach ridges and swales, the swales being the lower areas between the ridges, this landscape formed along the Thumb shoreline roughly 4,500 years ago, about the same time the great pyramids of Egypt were constructed. From west to east, successive beach ridges were deposited as the high glacial melt waters of the Nipissing Lake stage retreated and the earth's crust rose, depressed by the massive weight of ice during the final glacial advance in the Great Lakes roughly 11,500 years ago. The Hudson Bay region in Canada was pushed down over 1/2 mile below its current elevation by the thickest ice layer. Amazingly, the earth's crust is still rising from that depression of glacial ice. Like the annual rings of a tree trunk, each ridge and swale tells a story, preserving a record of our shoreline's post-glacial past. The biggest and oldest beach ridge runs continuously along the western edge of the habitat, furthest inland from Lake Huron. Although much of it has been mined out, the big sand ridge is still intact through Lakeside Cemetery and into Port Huron near the Blue Water Bridges where it is as wide as 500 feet and 10 to 15 feet high. As with today's residents, centuries ago this big sand ridge served as a burial ground for Native American inhabitants whose burial mounds have been found along this ridge from Port Huron north. Between the big western ridge and Lake Huron are smaller ridges and swales. Widths range from about 10 feet to a few hundred feet. The most well-defined are in Fort Gratiot and Burtchville Townships in Saint Clair County. On aerial photographs, ridges and swales stand out as a mile-wide band of alternating light and dark lines paralleling Lake Huron, tightly packed in some areas like grooves on a record disk. The right needle could play an ancient lakeshore tune. The lighter areas on the photographs are sand ridges. The dark strips between are muck-filled wetland swales. Muck is a black organic soil consisting of nearly pure carbon, the accumulation of centuries of plant material decomposed in shallow water. A huge muck area also formed west of the big beach ridge at the western edge of the habitat. Much of it drained by the early 1900s, it was so good for farming that the area around the Fort Gratiot Township hall and east along Keewahdin Road became known as "Gardendale". But, the area was still wet enough that older residents recall a time when tree trunks were placed in the road every spring to allow travel. Although impacted by sand and muck mining, livestock grazing, and development, much of the habitat remains intact and largely forested. Walking along the dry sand crests of the higher ridges, a person finds themselves amongst Red Oak, Black Cherry, Quaking Aspen, and Paper Birch. Several feet below are muck swamp of Silver Maple and Green Ash. Further north in Burtchville Township and Sanilac County, northern Michigan species like Northern White-cedar, Eastern Hemlock, and Yellow Birch become more prominent. Subtle blends of muck, sand, and water, combined with a cooler growing season along Lake Huron provides habitat for plant species that occur in few other parts of Michigan. 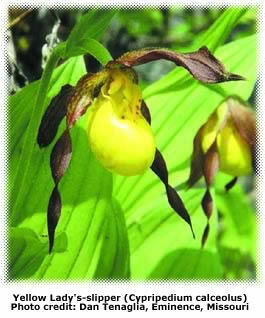 The habitat contains uncommon species like Purple-flowering Raspberry, and orchids like Yellow Lady's-slipper. 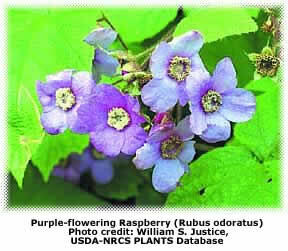 Purple-flowering Raspberry (Rubus odoratus) is a striking plant, with large maple-shaped leaves and large rosey-purple flower petals with pastel yellow centers. The species is thought to be native to only 7 shoreline counties in Michigan along Lake Huron and Lake Erie, including Saint Clair and Sanilac. In the Thumb, it grows only in the glacial ridge and swale habitat. Purple-flowering Raspberry is closely related to Thimbleberry (Rubus parviflorus), well known in Michigan's upper peninsula for Thimbleberry jam. The coastal forest of the glacial beach ridge and swale landscape is very important for migratory birds that move north and south along Lake Huron, supporting an abundance of warblers and other woodland birds. The Eastern Hognose Snake, usually a dune inhabitant in Michigan, and with the unusual habit of puffing up its neck like a cobra when disturbed (but otherwise harmless), is also known from this habitat. There never was much of this glacial beach ridge and swale habitat in Michigan. In the Thumb, it covers less than 1% of the landscape in a narrow band from Port Huron through Lakeport State Park, a thin strip north of Forester, and not much else. Unfortunately, very little attention has been given to the habitat in the Thumb. 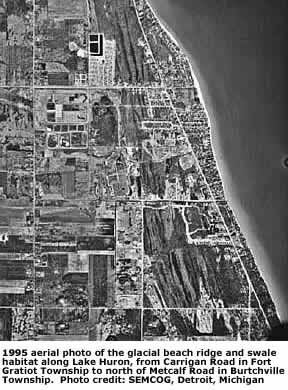 Since the early 1990s, large areas have been destroyed by development, especially within the commercial strip in Fort Gratiot Township. Hopefully, as awareness of this unique landscape increases, appreciation for it will grow.